«My sculptures are like a series of topographic layers. This slicing process is more than just a surgical operation — it is a language system. I decompose form into a series of profiles, much as the Impressionists, with all due respect, decomposed colour». This is how Jack Vanarsky introduces us to the artistic discourse that in 1968 became his distinctive feature: sculptures made up of moving lamellae powered by hidden mechanisms. In addition to his animated sculptures, however, Vanarsky was well-known for his transfigurations of famous works of art, his literary allusions (especially to authors like Kafka or Pessoa), and his subject matters (books, body parts, strings, butterflies, among others), unrelated to the abstraction of kinetic art. As it should be, O Livro do Desassossego [The Book of Disquiet], designed for the 5th Santo Tirso International Symposium of Contemporary Sculpture, is contained in the Municipal Library. 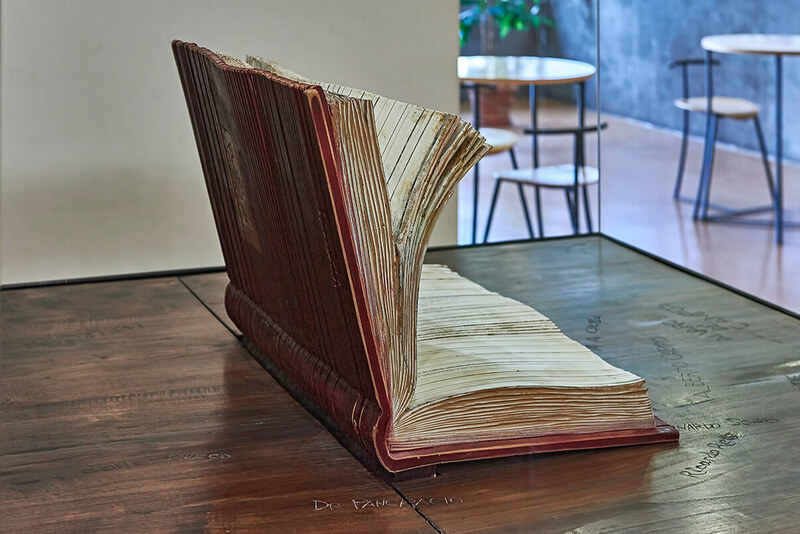 This sculpture-book, whose continuous movement evokes pages turning, is a perfect metaphor for a living book. The uniqueness of the piece (the only one to be contained indoors) derives from its umbilical relationship with the building — a place for reading, learning, imagining; a quiet place save for the rustle of book pages. More than a generic, abstract allegory, however, the choice of two pages from The Book of Disquiet, signed by Fernando Pessoa under the heteronym of Bernardo Soares, turns this work into a symbolic image and a “living” celebration of the Portuguese literary tradition.